Belleville (MI) Belleville cornerback Julian Barnett, a Michigan State commit, was offered by Michigan. 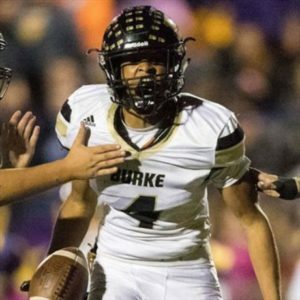 He’s a 6’1″, 186-pounder who claims a 4.41 forty, along with offers from Alabama, Auburn, Clemson, Georgia, Notre Dame, Ohio State, and Oregon, among others. Barnett could play corner or wide receiver at the next level. 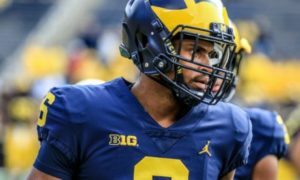 There has been much consternation from Michigan fans about why the Wolverines hadn’t offered earlier, and the pursuit has unfortunately begun after he committed to MSU in late December. Lakeville (MN) North offensive tackle Bryce Benhart was offered by Michigan. He’s a 6’7″, 285 lb. prospect with offers from Minnesota, Notre Dame, UCLA, and Wisconsin, among others. He’s a 3-star, the #43 offensive tackle, and #381 overall. The early expectation is that he will end up at Wisconsin. 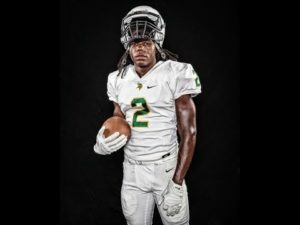 Buford (GA) Buford running back Derrian Brown was offered by Michigan. He’s a 5’11”, 174 lb. prospect with offers from Auburn, Florida, Notre Dame, Ohio State, and Oregon, among others. He’s a 4-star, the #13 running back, and #143 overall. Brown is a teammate of 2018 Michigan signee Christian Turner, which is quite a one-two punch in the backfield. Hit the jump for a bunch of other new offers. Warren (AR) Warren wide receiver Treylon Burks was offered by Michigan. He’s 6’3″, 180 lbs. and has offers from Arkansas, Florida State, and LSU, among others. He’s a 4-star, the #7 wide receiver, and #37 overall. He had some ridiculous numbers as a junior in 2017, when he ran 114 times for 936 yards and 27 touchdowns, and he caught 45 passes for 1,090 yards and 12 touchdowns. Suwanee (GA) North Gwinnett cornerback Warren Burrell was offered by Michigan. He’s a 5’11”, 175 lb. prospect who picked up a bunch of offers recently, including from Auburn, Florida, Notre Dame, and USC. He’s a 3-star, the #37 cornerback, and #426 overall. Pickerington (OH) Central defensive tackle DeWayne Carter was offered by Michigan. He’s a 6’3″, 270 lb. 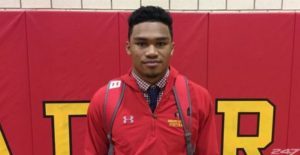 prospect with offers from Louisville, Notre Dame, Pitt, Tennessee, and West Virginia, among others. He’s a 3-star, the #24 defensive tackle, and #421 overall. 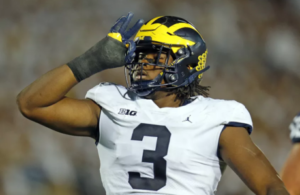 Carter attends the alma mater of former Michigan defensive end Taco Charlton, who now plays for the Dallas Cowboys. Hollywood (FL) Chaminade-Madonna safety Te’Cory Couch, a Tennessee commit, was offered by Michigan. He’s a 5’11”, 165 lb. prospect with offers from Nebraska, Oklahoma, and Ole Miss, among others. He’s a 4-star, the #23 athlete, and #260 overall. He has been committed to the Volunteers since June of 2017. Oradell (NJ) Bergen Catholic defensive end Aeneas DiCosmo was offered by Michigan. 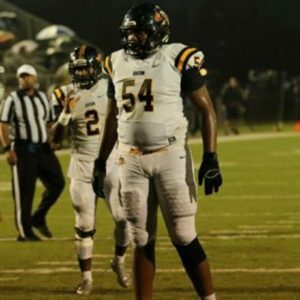 He’s a 6’3″, 220-pounder who claims a 4.65 forty, along with offers from Duke, Harvard, Maryland, Northwestern, Pitt, and Rutgers, among others. He’s a 3-star, the #42 weakside end, and #610 overall. He must be a pretty smart kid with that offer list. 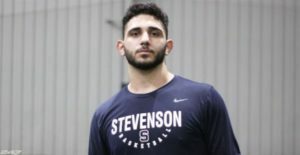 DiCosmo could also play tight end/H-back at the next level. Hollywood (FL) Chaminade-Madonna wide receiver John Dunmore, a Florida commit, was offered by Michigan. He’s a 6’2″, 172 lb. 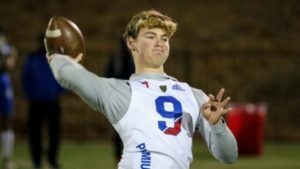 prospect with other offers from Auburn, Georgia, Nebraska, Oregon, Pitt, and Tennessee, among others. He’s a 4-star, the #25 wide receiver, and #132 overall. He has been committed to Florida since April of 2017. Fresno (CA) Washington Union wide receiver Demarcus Griffin was offered by Michigan. He’s a 5’9″, 170 lb. prospect with offers from Florida, Florida State, and TCU, among others. He’s a 3-star, the #109 wide receiver, and #774 overall. Little Rock (AR) Pulaski Academy tight end Hudson Henry was offered by Michigan. He’s a 6’5″, 225 lb. prospect with offers from Arkansas, Auburn, LSU, Notre Dame, Oregon, and Penn State, among others. He’s a 4-star, the #1 tight end, and #34 overall. Henry is the younger brother of Hunter Henry, who attended Arkansas and became a 2nd round draft pick of the Chargers in 2016. 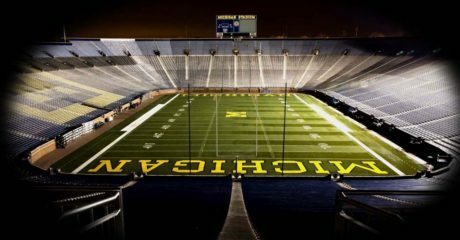 Wichita (KS) Northwest defensive end Marcus Hicks was offered by Michigan. He’s a 6’5″, 236 lb. prospect with offers from Missouri, Nebraska, Notre Dame, Oklahoma, Oklahoma State, Oregon, and Texas, among others. He’s a 4-star, the #21 weakside end, and #298 overall. He claims a 4.9 forty. Loganville (GA) Grayson wide receiver Kenyon Jackson was offered by Michigan. He’s a 6’5″, 200 lb. prospect with offers from Auburn, Florida, Florida State, Georgia, LSU, and Oregon, among others. He’s a 4-star, the #45 wide receiver, and #281 overall. 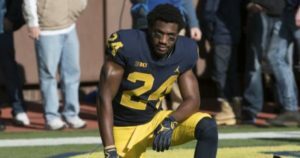 Jackson attends the school where Michigan freshman running back Kurt Taylor played football for his senior year. Columbus (OH) St. Frances DeSales defensive tackle Rodas Johnson was offered by Michigan. He’s a 6’4″, 285 lb. prospect with offers from Iowa, Minnesota, Northwestern, Notre Dame, Penn State, Pitt, and Wisconsin, among others. He’s a 4-star, the #14 defensive tackle, and #198 overall. He attends the alma mater of former Michigan offensive guard Patrick Omameh, who now plays for the Jacksonville Jaguars. Loganville (GA) Grayson offensive tackle Trente Jones was offered by Michigan. Jones is a 6’6″, 282 lb. prospect with offers from Florida, Mississippi State, Tennessee, and Texas A&M, among others. He’s a 4-star, the #36 offensive tackle, and #303 overall. 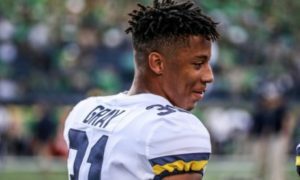 Grayson is a powerhouse program in the state of Georgia. 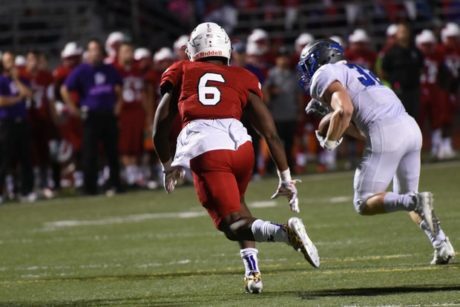 Clinton Township (MI) Chippewa Valley linebacker Marcel Lewis was offered by Michigan. He’s a 6’1″, 205 lb. prospect with offers from Iowa State, Michigan State, Syracuse, and some MAC programs. He’s a 247 Sports 3-star, the #15 inside linebacker, and #518 overall. Despite seemingly having Viper-type size right now, he has a thick lower body and will probably end up being a MIKE or WILL. Bellflower (CA) St. John Bosco cornerback Trent McDuffie was offered by Michigan. He’s a 5’11”, 175-pounder with offers from Cal, Notre Dame, USC, and Utah, among others. He’s a 3-star, the #48 athlete, and #481 overall. 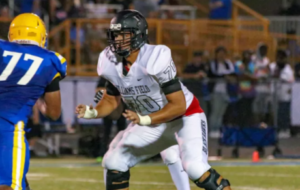 In the last couple years, McDuffie has transferred from Santa Ana (CA) Mater Dei to Rancho Santa Margarita (CA) Rancho Santa Margarita to Anaheim (CA) Servite to St. John Bosco, and I find it a little bit curious when a high school transfers that many times. 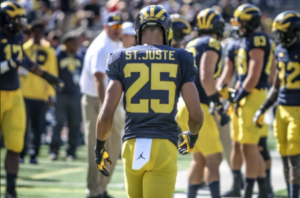 Hagerstown (MD) St. James School wide receiver John Metchie was offered by Michigan. He’s 5’11”, 190 lbs. and has offers from Maryland, Notre Dame, and Penn State, among others. He’s a 3-star, the #101 wide receiver, and #728 overall. 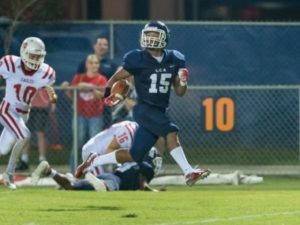 He had just 6 catches as a junior in 2017, but they went for 184 yards and 5 touchdowns. He also had 19 tackles and 2 interceptions as a cornerback. 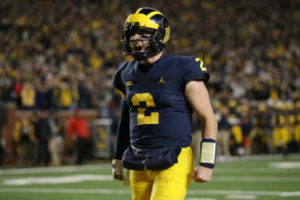 Mission (KS) Blue Valley North quarterback Graham Mertz, a Wisconsin commit, was offered by Michigan. He’s a 6’4″, 205 lb. prospect with other offers from Minnesota, Ohio State, and Ole Miss, among others. He’s a 4-star, the #7 pro-style QB, and #305 overall. Mertz committed to the Badgers in October 2017 and insists that he’s solid to Wisconsin. Folsom (CA) Folsom wide receiver Joseph Ngata was offered by Michigan. He’s a 6’3″, 180 lb. prospect with offers from Clemson, Florida State, Notre Dame, Oregon, UCLA, USC, and Washington, among others. He’s a 4-star, the #15 athlete, and #176 overall. His older brother, Ariel, is a linebacker for the Washington Huskies. 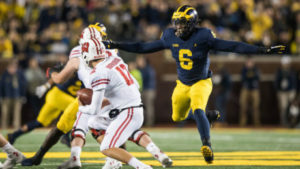 Everett (MA) Everett cornerback Mike Sainristil was offered by Michigan. He’s a 5’10”, 175 lb. prospect with offers from Boston College, Indiana, North Carolina, and Rutgers, among others. He’s a 3-star, the #96 cornerback, and #988 overall. 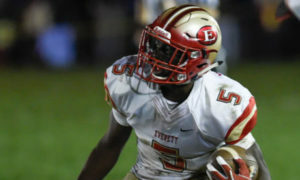 He’s a teammate of 2019 safety Lewis Cine, who also has an offer from the Wolverines, and Don Brown is the point man at Everett. Hollywood (FL) Chaminade-Madonna cornerback Keontra Smith, a Kentucky commit, was offered by Michigan. He’s a 5’11”, 205 lb. prospect with offers from Auburn, Florida, Nebraska, Oklahoma, and Oregon, among others. He’s a 4-star, the #9 safety, and #147 overall. He committed to the Wildcats in June of 2017. Mansfield (OH) Lexington linebacker Cade Stover was offered by Michigan. He’s a 6’4″, 215 lb. prospect with offers from Notre Dame, Ohio State, Oregon, and Penn State, among others. He’s a 4-star, the #7 outside linebacker, and #105 overall. 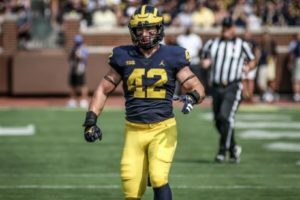 I put in a Crystal Ball for him to go to Ohio State, but he reminds me of former Michigan linebacker Ben Gedeon. Warwick (RI) Bishop Hendricken offensive tackle Xavier Truss was offered by Michigan. He’s a 6’7″, 325 lb. prospect with offers from Florida, Ohio State, Oregon, and Penn State, among others. He’s a 247 Sports 4-star, the #35 offensive tackle, and #292 overall. 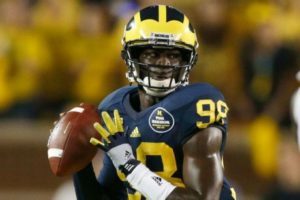 Bishop Hendricken is the alma mater of Michigan defensive end Kwity Paye. Hollywood (FL) Chaminade-Madonna defensive end Cameron Williams, a Florida Miami commit, was offered by Michigan. He’s a 3-star, the #30 weakside end, and #499 overall. He committed to Florida in July of 2017 and flipped to Miami on Saturday. 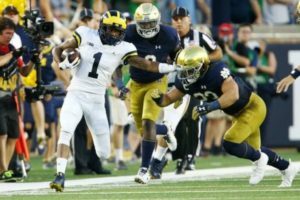 He’s a teammate of three other prospects who were offered – Couch, Dunmore, and Smith. Austin (TX) Lake Travis wide receiver Garrett Wilson was offered by Michigan. He’s a 6’0″, 185 lb. prospect with offers from Arkansas, Florida State, Georgia, Ohio State, Oklahoma, Oklahoma State, Texas, and Texas A&M, among others. He’s a 4-star, the #17 wide receiver, and #94 overall. As a junior in 2017, he caught 98 passes for 1,773 yards and 26 touchdowns. Here’s a list of visitors from this past weekend (LINK). The youngest Roanboy is home on break and went over to Chip to lift. He says they seem more impressed with David Ellis. Yeah, I was wondering about him, too. He’s starting to earn some attention.